EMENTO: Only place for all Your communication, collaboration, teamwork and self-organization! EMENTO: One place for all Your communication & collaboration and making quick business decisions! EMENTO: Projects, Tasks, Activities, Documents, Events, Statuses, Messages, Email marketing and many other apps! 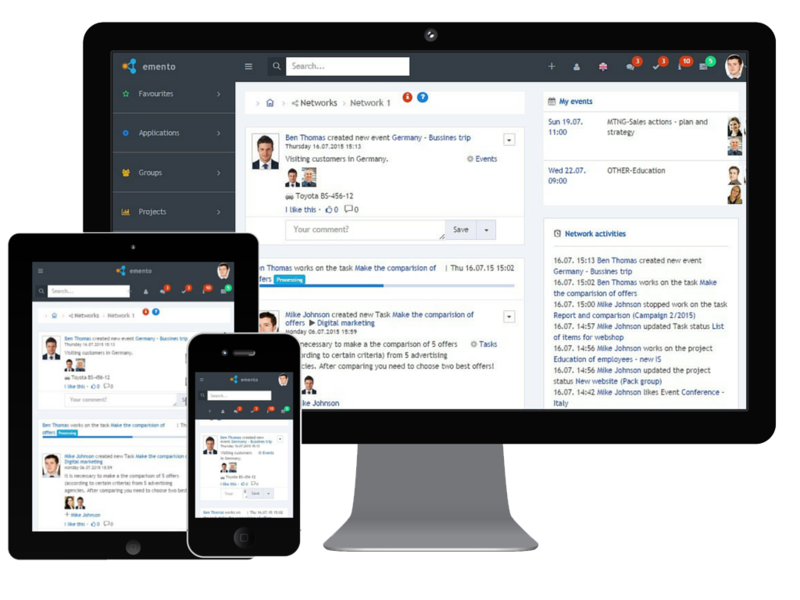 Emento is new generation of enterprise software with "Social" base. One place for all Your communication & collaboration and making quick business decisions. All Your work happens in different types of Emento workspaces (public workspaces are visible to everyone, private workspaces have limited visibility, secret are hidden). Emento is company knowledge and awareness platform. It will keep all participants informed and up-to-date, creating rich business context. With Emento, You will spend less time on sending e-mails, phone calls, meetings and paperwork. Emento is intended for all organizations, from smallest to largest and for all who wants to extend many of current limits - technical (all devices), time (24/7) and space (office in Your pocket). Emento will maximize business productivity, improve communication and collaboration within the organization and save money and time. EMENTO will maximize business productivity, improve communication and collaboration within the organization and save time and money. It will keep all participants informed and up-to-date, creating rich business context. Super easy and friendly to use. Emento is easy to use and does not require advanced IT knowledge. It is available 24/7 from any device (PC, tablet, smartphone). It will keep all participants informed and up-to-date, creating rich business context. Internal e-mail, meetings and phone calls become unnecessary. Emento is Cloud system and there is no need to invest in expensive infrastructure. Super easy and friendly to use. Emento is multilanguage and open to new languanges. All upgrades and maintenance are free for all Emento users. EMENTO is one place for all Your work (communication, collaboration, teamwork, self-organization, ...). It is intended for all organizations, from smallest to largest and for all who wants to extend many of current limits - technical (all devices), time (24/7) and space (office in Your pocket). We use Emento from the beginning we and are very satisfied. Our internal communication & collaboration is better and faster and we spend less time on email, phone calls and meetings. With Emento we can track all activities in our organization in a very simple way. Emento also enables us to monitor who is working on what at any time, with tasks and project managing. Emento reduced time spent for communication and collaboration - document and event management, approvals, requests ... Emento workspaces are new way for team to organize, enables kind of self organization which results with better teamwork. It is available from any device (with Internet access), which gives us access to all information 24/7. Emento maximizes our business productivity, improve communication and collaboration within the organization. It is easy to use, and it saved us a lot of time in performing everyday tasks.